Aluminium front doors are one of the newest products available if you are looking to change the front door to your property. At Northwest Bifolds, we already offer the Endurance composite front door, one of the best and more secure front doors on the market. There is also the choice of the latest generation aluminium front doors. Aluminium front doors. Some questions answered. Contact us today to discover the very latest in cutting-edge, affordable and premium quality front doors for your home. With a 20 year guarantee. An aluminium front door is the latest product available alongside composite and timber doors providing a secure, thermally efficient and attractive entrance small your home. We answer some of the most common questions about aluminium front doors. What is an aluminium front door? An aluminium front door consists of a thermally insulated aluminium frame and door. You then have the choice of customising your front door, choosing one of our decorative aluminium panels, glass, aluminium bars or a combination of glass and panel. There are already many different combinations of composite front doors available, but you may find even more choice with an aluminium door. My house has PVCu windows. Should I have an aluminium front door? There is no reason why you cannot have an aluminium front door if you already have PVCu windows in your home. If you want to match the white PVCu frames of your windows, then consider a composite door with a PVCu frame. Alternatively to create a different entrance aluminium could be better. I’m having aluminium windows fitted, Should I have an aluminium front door? 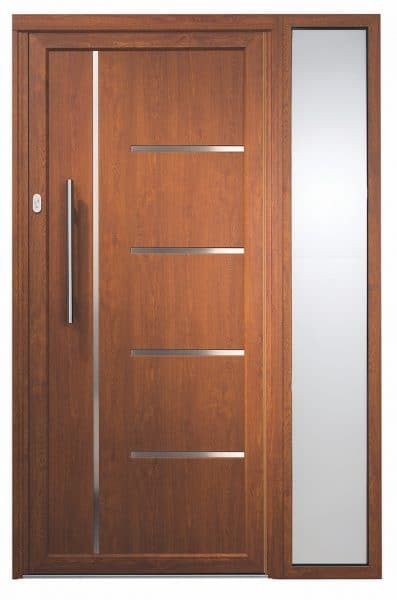 The choice is yours as all our door types will offer you impressive security, energy efficiency, reliability and style. One of the advantages of an aluminium front door is that you can colour match your window frames accurately. Colour matching to an exact shade is harder to achieve with a PVCu, timber or composite front door. Colour choice and colour matching are one of the big advantages of aluminium front doors. What is stronger? An aluminium front door or a composite door? When comparing an aluminium front door to a composite door, the two types of doors are entirely different in their construction. 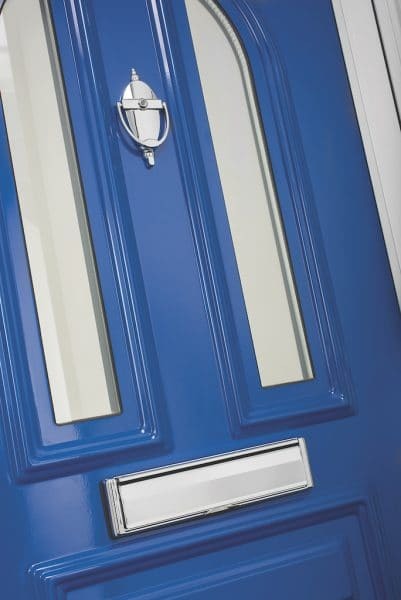 A composite door uses a timber core with an external skin that creates a door sash. This is then attached to the door frame. An aluminium door consists of an aluminium leaf and frame with an aluminium panel that is ‘glazed’ into the door just like a piece of glass. The aluminium door consists of two skins of thick aluminium with a timber and thermal core internally. Both doors are secure, both door types have been independently tested for security and come with the latest in handles and multi-point locking systems. What styles are available with aluminium front doors? Our range of aluminium front doors comes in a choice of either traditional or modern style to suit your home and your tastes. Our Origin Residential Front Doors as one example is available in the older styles typical of classic front doors, as well as the option of having these in an authentic wood effect aluminium finish. Choose a contemporary front door, and we offer satin or stainless steel modern handles, beautiful panel designs, modern glass and much more. Contact us for more information. What are the other benefits of aluminium front doors? An aluminium front door also provides other advantages not possible with some PVCu and composite doors. If you have a cottage with a narrow front door, composite door slabs may not be available. Aluminium doors can solve issues with small front doors. Aluminium front doors are possible wider and taller than conventional doors. If it is an oversize door you are looking for, aluminium front doors may be a great solution. Aluminium doors also integrate well with windows and screens. This means they are ideal for creating doors set within large screens, new porches or with shapes, curves and other styles. We think aluminium doors offer more design possibilities. Thinking about replacing your front door? Contact Northwest Bifolds. At Northwest Bifolds we offer a quality range of front doors whatever your property and budget. Contact us today for a free, no-obligation quotation and to see some of our products.